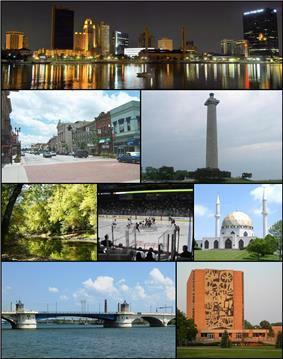 Images, from top left to right: Toledo Skyline, Downtown Bowling Green, Put-in-Bay, Goll Woods Nature Preserve in Fulton County, Toledo Walleye game, Islamic Center of Greater Toledo in Perrysburg Township, MLK Bridge in Toledo, and the Jerome Library in Bowling Green. The Toledo metro area and its surrounding area. The Toledo, OH Metropolitan Statistical Area is a metropolitan area centered on the American city of Toledo, Ohio. As of the 2010 census, the MSA had a population of 651,429. It is the sixth largest metropolitan area in the state of Ohio, behind Cincinnati-Northern Kentucky, Cleveland, Columbus, Dayton, and Akron. Located on the border with Michigan, the metropolitan area includes the counties of Fulton, Lucas, Ottawa and Wood. The Toledo metro area has strong ties to Metro Detroit, located 40 miles north. Toledo is also part of the Great LakesMegalopolis. The separate micropolitan area of Fremont, Ohio, which has strong commuter interchange with the Toledo metropolitan area, is included in the Toledo-Fremont Combined Statistical Area. The wider region of Northwest Ohio adds Defiance, Hancock, Henry, Paulding, Putnam, Seneca, Van Wert, and Williams counties. There are several institutions of higher education that operate campuses in the area. Some of the larger schools include The University of Toledo, Mercy College of Ohio, and Davis College in Toledo. Lourdes University in Sylvania, Stautzenberger College in Maumee, Owens Community College in Perrysburg Township, and Bowling Green State University in Bowling Green. As of the census of 2010, there were 659,188 people, 259,973 households, and 169,384 families residing within the MSA. The racial makeup of the MSA was 83.03% White, 12.01% African American, 0.25% Native American, 1.07% Asian, 0.02% Pacific Islander, 1.79% from other races, and 1.83% from two or more races. Hispanic or Latino of any race were 4.35% of the population. The median income for a household in the MSA was $42,686, and the median income for a family was $51,882. Males had a median income of $38,959 versus $25,738 for females. The per capita income for the MSA was $20,694. The Toledo-Fremont Combined Statistical Area includes the Fremont micropolitan area. The population of the CSA in 2010 was 712,373.